Last year, despite achieving my goal of 120 books read and reviewed, I read about 20 books less than during Cannonball 9 which I attribute to spending a lot of time on books I either didn’t finish (Between the Bridge and the River) or spent more time than was necessary sloughing through (Map of Days). My goal this year, besides a humble Double Cannonball, is to allow myself to make quicker decisions regarding books I don’t want to finish. 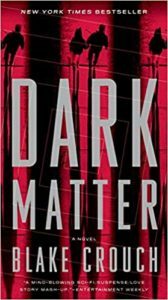 Luckily, I started my year on the right foot with Blake Crouch’s Dark Matter. Jason Dessen made a choice 15 years ago when his then girlfriend, Daniela, found out she was pregnant. He decided to step up and be her partner even though it meant sidelining his promising career while Daniela gave up her chance to become a famous artist. Jason is now a college professor and his former best friend has just won a prestigious award; Daniela encourages her husband to make an appearance at the local bar where his friend is having a celebratory party. As Jason returns home from the evening everything changes. It is hard to explain too much about this one without spoiling it; I began explaining the plot to my husband because I thought he would enjoy it and he exclaimed “spoilers” before I had said two sentences. Essentially Jason is kidnapped and sent to an alternate reality where he did not stay with Daniela and instead went on to have an illustrious career in theoretical physics. Jason does not see his new reality as a science star as a blessing but instead goes through Hell trying to return back to the reality he knows. I thought the premise on this one was incredibly intriguing and well thought out, especially the twist near the ending but I really hated the language in this one. There was a lot of unnecessary crude language that felt out of place, especially when it was sexual, that took me out of the story (it probably didn’t help I was listening to the audiobook and swear words always sound worse out loud then in print) but that is a minor quibble. Share the post "“We’re more than the sum total of our choices, that all the paths we might have taken factor somehow into the math of our identity.”"